During conversation, it’s often useful to call the attention of other members in the chat room using an @mention. To mention a user, you’d need to type in the @ symbol followed by a member’s username. If the person you mention is a member of the room, the mention will be highlighted in blue. On the other hand, mentions of the current user will be highlighted in yellow. Prior experience with building React and Node.js applications is required to be able to follow through with this tutorial. You also need to have Node.js (version 8 ) and npm installed on your machine. You can view this page for instructions on how to install Node and npm on your machine. The first thing you need to do is create a free Chatkit account, or sign in to your existing account. Next, create a new Chatkit instance and take note of your Instance Locator and Secret Key in the Credentials tab. Following that, switch over to the Console tab and create a new user and room for your instance. You can follow the instructions on this page to learn how to do so. Once the room has been created, take note of the room ID as we’ll be using it later on. Let’s go ahead and set up a simple Node server to power our application. Create a new directory for this project, cd into it, then run npm init -y to initialize the project with a package.json file. Next, install all the dependencies which we’’ll be needing on the server with the command below. The @pusher/chatkit-server package is the Node.js server SDK for the Chatkit service. The /users route takes in a username and creates a Chatkit user through the chatkit instance, while /authenticate tries to validate anyone who tries to connect to our Chatkit instance by responding with a token (returned by chatkit.authenticate) if the request is valid. For the purpose of this tutorial, we don’t actually try to validate the request before returning the token, but you need to do so in your production code. That’s all we need to do on the server. You can start it on port 5200 by running node server.js in the terminal. Once the dependencies have been installed, you can start the development server by running npm start from within the client directory, then navigate to http://localhost:3000 in your browser to view the app. There's a lot to unpack here, starting from the Join Chat form on the sidebar. Once the user submits this form, the addUser() method is invoked and a POST request is sent to the /users route, which results in the creation of a new Chatkit user which can be accessed through the currentUser object. This object is the primary interface to interact with our Chatkit instance. Following that, the user will be added to the room whose ID was provided in the subscribeToRoom method. We’ve also set up two room connection hooks here: onMessage is invoked anytime a new message arrives in the room, while onPresenceChanged is invoked when a user comes online or goes offline. Because we’ve set messageLimit to 100, the most recent 100 messages in the room will be displayed on the screen. If you want to prevent any messages from appearing, you can set messageLimit to 0. Finally, the sendMessage method is invoked whenever the form below is submitted. This method calls sendMessage() on the currentUser and sets the value of newMessage to an empty string so that the input is cleared. At this point, you should be able to connect to the room and send a message. Don't forget to replace <your chatkit room id> and <your chatkit instance locator> with the appropriate values. Sometimes you’ll need to call the attention of another member when having a conversation. In most applications, you can do so by typing @ followed by the username of the member. Mentions are usually highlighted in a different color so that they can be easily spotted in the text. The ChatSession variable is where the majority of the logic to spot a mention is held. We search for mentions in each message and verify that the users that are mentioned are members of the current room. If so we wrap each mention inside a <span> tag so that we can highlight them in the message. You can test it out by adding multiple users to the room, then mentioning any user in a message. @mentions of the current user will be highlighted in yellow, while mentions of other members are highlighted in blue. Typing the @ symbol followed by a member’s username will give you a narrowed down list of members to choose. When you find the member you want to mention, simply press the tab key to autocomplete and make your selection. 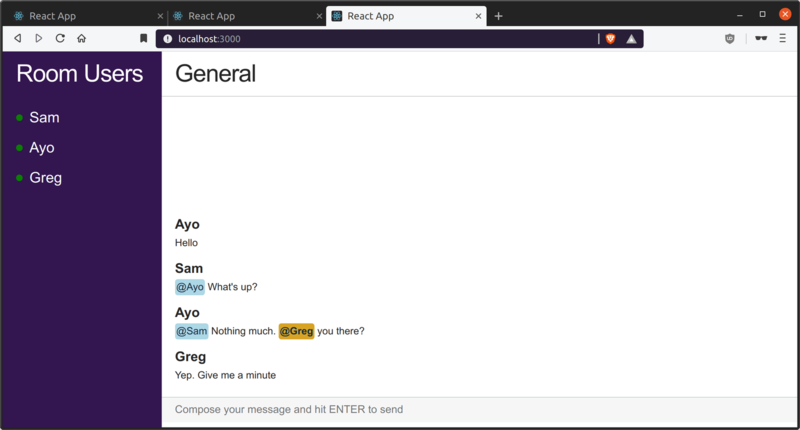 In this tutorial, we created a chatroom and added the ability to mention members of the room. We also covered how to autocomplete @mentions in the room. You can checkout other things Chatkit can do by viewing its extensive documentation. Don't forget to grab the full source code used in this tutorial here.